Hear Your Favorite Shrek the Third Quotes Anytime You Want! 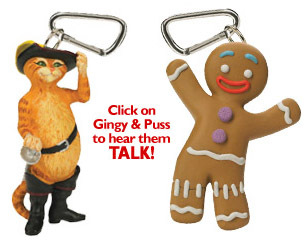 Our Gingy talking clip-on is the only quality talking Gingy figure on the market. Get it while they are still in stock! Looks and sounds so real you'll think he jumped off the movie screen straight into your pocket. Gingy talking pen also available. These Shrek 3 clip-on character figures say up to 4 hilarious lines of high-quality audio from the blockbuster new sequel Shrek the Third. This beautifully sculpted figurine uses the actual voices from the movie. At only 3" tall, these talking figures can be clipped on to a backpack, keyring, bookbag, purse, notebook...anything! It's the perfect companion for any Shrek fan. *100% Warranty! We will replace your product, no questions asked, for the cost of shipping and handling, within three year of purchase. Check out our Shrek 3 Cool Stuff Pages! Listen to your favorite “Shrek the Third” characters spout hilarious one-liners from their pen. Hear Shrek, Donkey, Puss, and Gingy! 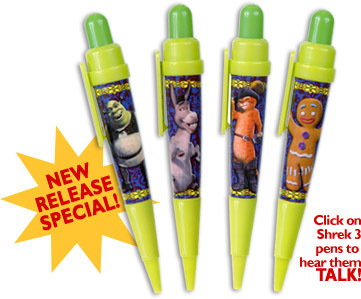 Each pen features one character, and plays four different lines the character says in “Shrek the Third.” The high-quality audio is taken right from the film’s soundtrack! Enjoy hearing these great lines anytime, anywhere!